For their first show together, the Thabet brothers have chosen to bewitch their audience with Sufi music. 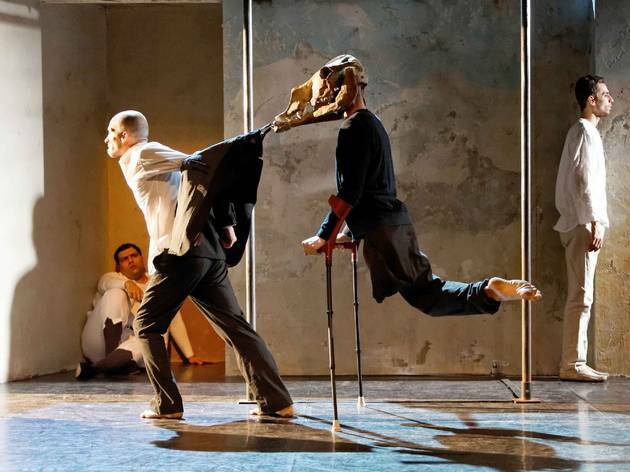 Extracts from the Koran are chanted by five Tunisian musicians, arranged around a stage where three dancers respond to the rhythm of the percussion with part-choreography, part-acrobatics. Each dancer represents an emblematic and transcendental figure: death, madness and reason. They throw themselves into the air, bend their bodies, and interact with each other in powerful and serene harmonies. And then there’s the presence of the mythical animal Hédi, one-legged and wearing a skull mask, twirling on his crutches. A hotly-anticipated show at the Théatre Gérard Phillippe.